You’re at a weekend music festival. It’s raining, mud is splattering all over the place, and to top it all off, your cell phone battery is dying. 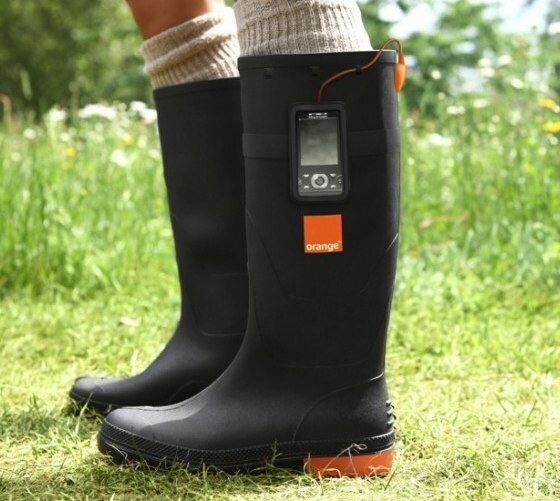 That’s where the Orange Power Wellies, created as part of a collaboration between U.K. cell phone company Orange and GotWind, come in. The prototype boots, unveiled at this week’s Glastonbury Festival, feature a power-generating sole that turns heat from your feet into an electrical current. The power collected in the ‘power generating sole’ is collected via a process known as the ‘Seebeck’ effect. Inside the power generating sole there are thermoelectric modules constructed of pairs of p-type and n-type semiconductor materials forming a thermocouple. These thermocouples are connected electrically forming an array of multiple thermocouples (thermopile). They are then sandwiched between two thin ceramic wafers. When the heat from the foot is applied on the top side of the ceramic wafer and cold is applied on the opposite side, from the cold of the ground, electricity is generated. This isn’t Orange’s first attempt at building a renewable energy-powered gadget for music festivals. The cell phone company teamed up with GotWind last year to build the Power Pump, a cell phone charger that captures kinetic energy from an air bed foot pump. And the company’s Solar Concept Tent, unveiled at last year’s Glastonbury Festival, features “photovoltaic threads” that power a central wireless hub in the tent. None of these concepts have turned into actual products, however, so we doubt that we’ll see Power Wellies on store shelves anytime soon.